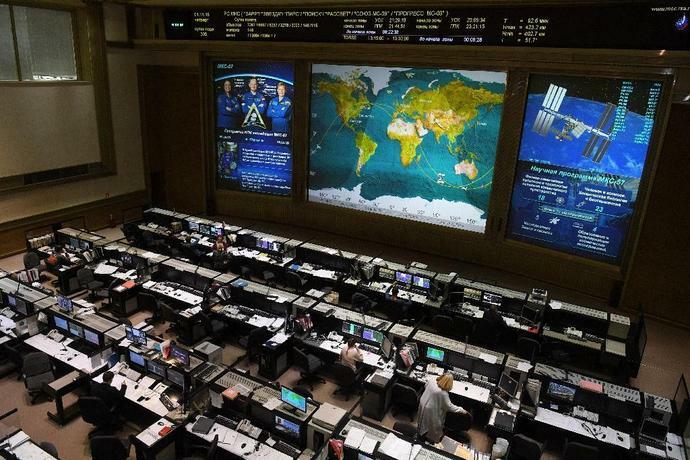 Russian Mission Control Centre outside Moscow. Geneva (AFP) - On the surface, this looks like a terrible moment for the world's major military powers to negotiate a deal on preventing an arms race in space. Last month, UN chief Antonio Guterres warned that the global disarmament architecture was "collapsing," citing various diplomatic failures, including Washington's decision to scrap a crucial nuclear weapons treaty with Russia. Meanwhile, the Pentagon has drafted plans for a new "Space Force" on orders from President Donald Trump who has declared space a "war-fighting domain". Despite those headwinds, experts from 25 countries -- including China, Russia and the US -- open a 10-day meeting in Geneva Monday aiming to lay the groundwork for a treaty to keep space peaceful. Even against the grim diplomatic backdrop, experts say there may be reasons for optimism. "I hope I am not just indulging in wishful thinking here but I do see some positive initiatives against this rather dark background," said Paul Meyer, Canada's former disarmament ambassador and an expert on space security at The Simons Foundation in Vancouver. The closed-door Geneva talks involve a UN panel called a Group of Governmental Experts (GGE). Chaired by Brazilian ambassador Guilherme de Aguiar Patriota to the UN Conference on Disarmament, the space GGE works on consensus and will only issue a report if all parties agree on its content. Diplomatic efforts to forge a space treaty have been deadlocked for more than a decade. A main problem, experts said, is that China and Russia have insisted on preventing certain devices from being deployed in space. This has been a non-starter for the West which has instead favoured language that emphasises "behaviour" or "actions" in outer space that could be restricted. Patriota told reporters the level of dialogue at the first GGE meeting in August was "several notches" better than in the past, with China and Russia indicating an openness to new ideas. At next week's second and final meeting, the GGE will try to agree on a list of "elements" that could form a treaty, he said. "We are making a big step here," he added. Patriota noted that one factor possibly motivating states to move forward is the notion of "vulnerability" in space. Notwithstanding the rhetoric of a leader like Trump who boasts of ever-expanding defence budgets, military professionals understand that overwhelming dominance is not enough to protect a nation's space assets, experts said. "Asymmetrical capabilities are big," Jessica West, project manager of the 2018 Space Security Index report, told AFP. "It is very difficult for any action to defend their assets in space alone," she added. Meyer, also the ex-head of the intelligence bureau at Canada's foreign ministry, told AFP that another factor creating diplomatic momentum is that space "is no longer just a rich man's club". Dozens of countries including developing nations now operate satellites and that list will only grow, he said. Space technology -- whether related to reconnaissance, mapping or navigation -- has also become an integral part of both military and civilian everyday life. The question governments face is "where are the best interests of the nation served?" Meyer said. "Is it in sparking a further arms race relating to this very vital environment for global prosperity... or is it in making an effort to devise arrangements with some of your potential adversaries," to keep space peaceful, he added. Patriota conceded that Trump's move in August to create a new military branch dedicated to space hangs over the talks. But, he said, US participation so far had been "constructive". West stressed that despite Trump's "inflammatory" rhetoric, parts of his space force proposal are actually not that confrontational. "Some of it is a bureaucratic reorganisation," which will see personnel already working on space in the Navy, Air Force, and Army brought under one roof. The US is also just following moves made in China and Russia, which already have military departments dedicated to space, experts noted. Patriota said that any kind of consensus document that outlines a potential path towards a treaty would be a success for the GGE. The consequences of failure are harder to predict. Some expect the talks to sputter out and join a long list of UN disarmament efforts that have fallen flat. But, West warned, the stakes next week may be higher. "I think we are reaching a breaking point... and this may be the last opportunity to step back from the brink and maintain outer space as a direct combat-free zone," she said. "If we do slip over the edge, then reining it in will be near impossible."